If you like unique style linen walking suits that won't have you dressing like everyone else, step up to the plate and try Royal Prestige. Royal Prestige makes high quality Irish Linen walking suits with fancy detailing that leaves other brands looking just the same as everyone else. This cream color Irish linen walking suit features a fray patch and sewn design on the shirt giving style and fashion that Royal Prestige is known for by men who appreciate the finer clothing in life. The pants come pleated and baggy for comfort. Just add attitude. 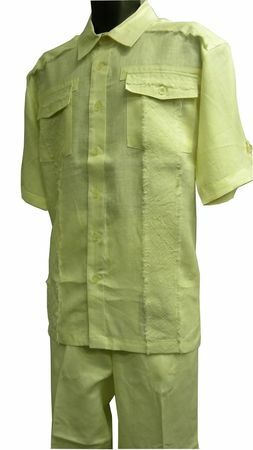 Find More Mens Linen Walking Suits Here.